Easily scaled to just about any skill and strength level, hiking is arguably one of the most rewarding and easily accessible outdoor activities around. It can be as simple as a short trek through a public trail or as tricky as a day-long journey to the bottom of a canyon, but if you invest in a more challenging or long-term hike, you’re going to need the right gear. The most common way to tote all that gear, of course, is by backpack, but this can be prohibitive to smaller hikers or those with bad backs or other physical challenges. So how can you workaround the problem of transporting gear when backpacks aren’t the best option? Luckily for you, there’s the handy, versatile backpacking cart. What is a Backpacking Cart? Put in simplest terms, a backpacking cart is a one-wheeled cart designed to carry all your gear throughout any terrain you traverse on your outdoor adventures. This includes hiking gear, camping gear, fishing gear, hunting gear (plus the spoils from your hunt), and even that precious progeny gear — your children. Outdoor carts might sound like they’d be bulky, unwieldy, and difficult to navigate through the wilderness, but this couldn’t be further from the truth. The simple, streamlined design of hiking carts make it incredibly easy to push heavy loads from site to site without taking a toll on your back or knees. This isn’t like shoving an uncooperative grocery cart with a rogue wheel up the side of a mountain; the backpacking cart moves with surprising ease, allowing you to travel faster and further without the fatigue and strain that comes with carrying a backpack. 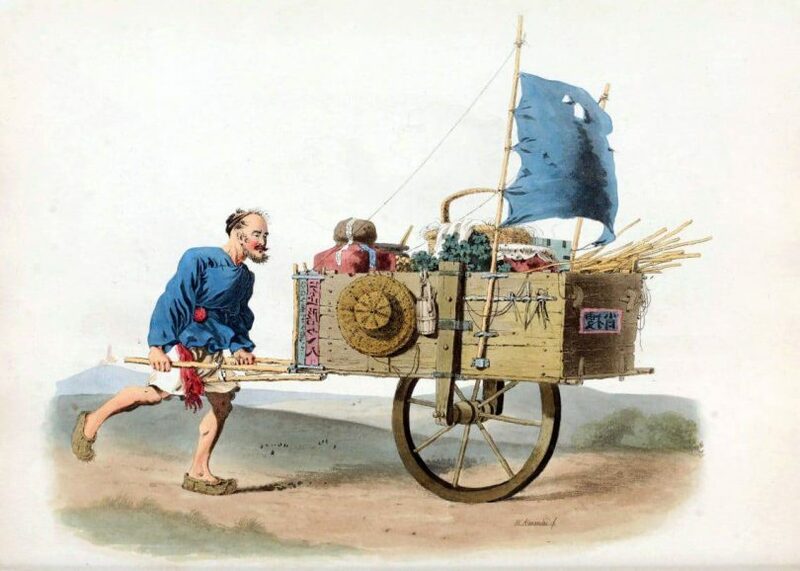 Modern-day backpacking carts borrow (or “barrow”) their design from the straightforward construction from the Chinese wheelbarrow, which was utilized for centuries to transport goods and people across the thoroughfares of China. Unlike the more common (to us) European wheelbarrow—which has the small front wheel and large, shallow bed that we are familiar with today—the Chinese wheelbarrow had one large wheel in the middle of the cart, and this small adjustment enabled it to carry up to six times more weight than its European counterparts. The Chinese wheelbarrow with its centrally-located wheel emerged onto the scene in the 3rd century. This dynamic cart could transport up to six adults at one time, powered either by beasts of burden, wind power, or human muscle. But instead of being pulled, which demands a significantly more intense amount of energy and strength, the Chinese wheelbarrow was pushed. Mounting the wheel in the center of the cart allowed for equal distribution of weight between the wheel and whoever was pulling, and this made the wheelbarrow significantly more efficient. Around the 17th century, the Chinese wheelbarrow caught the attention of Europeans. In particular, Andreas Everardus van Braam Houckgeest of the Dutch East India Company detailed the Chinese wheelbarrow’s design and capabilities in his writings of 1797, and this record holds as proof of the cart’s esteemed place in history and culture. The tradition Chinese wheelbarrow was still being widely used throughout the country as of the 1960s. Looking for a way to make transporting gear quicker and less strenuous, modern-day outdoor adventurers were quick to lock in on the clear advantages of the Chinese wheelbarrow. The single wheel made it easy to maneuver tricky terrain and narrow passages without tipping over, and—with the addition of a disc brake system, ergonomic details, and some other improvements—the ancient Chinese wheelbarrow was fully updated and totally trail-ready. Two major purveyors of hiking carts to be found today are the Honey Badger Wheel cart and the Pack Wheel cart. Each are manufactured by outdoor experts who have put countless hours of research and testing into their products, and a visit to their respective websites will give you all you need to know if you’re interested in exploring the wheel-packing lifestyle. We’ve already covered the backpacking cart’s manageable one-wheel design and brake system, so let’s take a look at how it manages to make such a fantastic and functional replacement to the traditional backpack. You can load gear onto a hiking cart in a few different ways. Bicycle panniers (or panniers made especially for your cart) can be bungee-corded to the sides of the cart frame, with other gear/backpacks strapped to the top, or vice versa. Gear can also just be corded onto the top of the cart with nothing on the sides, but it should be noted that panniers or other gear equally distributed on the sides will lower the cart’s center of gravity, making it easier to control and navigate. Also, if you only need your cart to transport game at the end of your trip, some lightweight carts on the market are collapsible and can be carried on your backpack until needed. With today’s thoughtful, lightweight, ergonomic designs, the action of pushing a backpacking cart is similar to holding onto the handles of a bike. Your arms won’t be carrying any weight (it’ll all be centered over that handy wheel, remember? ), but you will need some arm strength to push up any significant inclines. Likewise, you will want to hold down on the handles while traveling down inclines, to balance out the weight of the cart’s load shifting forward. Cart users have testified that keeping their arms on the handles is similar to the stabilizing experience of using a walking stick. You may be wondering if there’s any advantage to pulling the backpacking cart instead of pushing. The short answer is no: it is possible to pull the cart, but the amount of energy you’ll expend doing so is far and above the practically effortless experience of pushing it. Making turns with the cart is also much trickier if you pull, whereas when you push, you can easily navigate the tightest of corners. If you’re really concerned about your ability to push, you can look into the option of equipping your outdoor cart with an electric motor. There are currently no manufacturer-approved or -offered motors for the most popular carts on the market today, but some consumers have equipped their carts with electric hub style motors. The manufacturers of the Pack Wheel have tested these types of motors with their carts, only to find that they ran at too high a speed for a walking pace, which resulted in the motor overheating and shutting down at regular intervals. Not exactly a attribute to your day on the trail. Unlike the one-size-fits-all cart culture in ancient China, manufacturers now offer a variety of backpacking carts to suit your all your weight and capability requirements. Hiking cart. This multi-purpose choice is the go-to for taking to the trail with a cart rather than a backpack—those in the know call it “wheelpacking.” Typical hiking carts can carry up to (and sometimes over) 200 pounds. Fishing cart. This sturdy cart allows you to strap multiple coolers to the frame, so your fish can enjoy their own private quarters, away from your drinks and snacks. Hunting cart – Big game carts can carry boned or deboned meat in bags or corded to the frame in quarters. Special accessories (more about that later) can help streamline your big game transport. Hiking stroller. Perhaps the most impressive use of the cart is when it does double duty as an all- terrain stroller. However, not all carts on the market are appropriate or recommended for transporting children. The Honey Badger Wheel cart has special seats available that allow you to carry up to three kids; the folks at Pack Wheel do not recommend their product be used for stroller duties. Backpacking carts are relatively self-sufficient animals, but when called upon to execute specialized tasks, the job gets done a little easier with the help of some accessories. We’ve already mentioned the use of panniers when it comes to attaching gear to your cart, and while bicycle panniers will work just fine, you may want to look into some cart-specific panniers that are designed to work best with the construction and frame of the cart. This is particularly true when it comes to transporting big game. Manufacturers of hiking carts offer cart panniers that can carry up to 100 pounds of meat per pannier. The Honey Badger Wheel cart offers the option of heavy duty swivel arms that can be added to the cart. These swiveling platforms will hold heavy items such as coolers or boxes parallel to the ground while maintaining optimal cart balance. Consumers also have a variety of wheel sizes to choose from when outfitting their carts. Cart wheels typically come in sizes ranging from 20 to 29 inches; the larger the wheel, the better the cart will be at rolling right over anything in its way. On the flip side, smaller wheels are easier to store and carry. In terms of traveling through snow, you’ll have to consider the type of snow you’re asking your cart to navigate. Loose powder is no trouble for a 24-inch wheel, but that size won’t be optimal if the show is wet and heavy. The folks at Pack Wheel recommend a 29-inch wheel as your best bet in all snow travel situations. Once you have your backpacking cart purchased, outfitted, and loaded up for the journey ahead, you’ll be anxious to hit the trail and see just what this baby can do. So…just what can this baby do? Well, that will differ from cart to cart, but here are some basics to give you an idea of what you can expect out of your hiking cart’s performance. Backpacking carts are true workhorses in terms of the weight they can carry, but there are obviously limits, and most carts have a weight limit of 200 pounds total. Manufacturers warn against placing backpacks or parcels heavier than 50 pounds in the space above the wheel, but this leaves you with 150 pounds to play with when it comes to your panniers and other areas of the frame. This distribution of weight is best for the cart’s frame, and also creates an optimal low center of gravity, which allows the person pushing the cart to have the highest possible control. If 200 pounds doesn’t sound all that impressive to you, consider carrying that amount of weight on your back throughout multi-terrain and multi-elevation environments. Your back and knees wouldn’t thank you much for that. When it comes to navigating through obstacles in your path, outdoor carts can usually face most small hurdles head-on. Pushing the handles toward the ground as you approach an obstacle will help the wheel roll easily on over, but if your obstacle is bigger (or your cart is heavier), you’ll need to take a more involved approach. When attempting to cross over something like a large rock or log, you should turn the cart and your body around, facing away from the obstacle, so that you can essentially approach it backwards, pulling the cart towards you and over the obstacle. If you’re on a particularly steep bit of trail, you’ll also want to utilize the brake whenever you feel you need it, therefore preventing the cart from giving in to gravity at an inopportune time. The most important advice when it comes to obstacles is to never force your cart through heavy growth or over large obstructions. Always employ the turn-around-and-pull method to protect your cart. Your cart might seem like a beast capable of conquering any given trek or trail, but remember: not all areas are down with wheels. Federal grounds that are officially designated as Wilderness Areas do not allow wheels, and backpacking carts are no exception. However, park officials are here to help and understand that some patrons have physical limitations and need the assistance of wheels to be able to enjoy the outdoors. Make sure you have the correct hiking boots to make trekking seamless. If the grounds you’ve chosen for your cart-led adventure doesn’t allow wheels and you are unable to carry the weight needed to make the outing possible, contact the officials in charge and explain your situation. You may be granted special permission to take your cart along, and the park rangers will appreciate your having gone through the proper channels. Now that you’ve learned all the wonderful things outdoor carts have to offer, perhaps you’ll consider subbing that back-breaking backpack with a convenient and versatile cart. This centuries-old technology has resurfaced in a new and inventive way to make your outdoor activities even more enjoyable, and—with the exception of braving the trails on a unicycle—backpacking carts are far and away the most fun you’ll have wandering the wilderness on one wheel. For more ideas on what to include in an ultralight backpacking list, check out our earlier article. Upon seeing all these benefits of a hiking outdoor cart, would you consider getting one for your trips? Or perhaps, you already have the pleasure of using one? Feel free to share your thoughts in the comments! TOP GEAR PICKS Best Fire Starter Sticks: Easy As Snap, Spark, Light!